Chris Liebing started Djing in the area of Giessen, Germany near Frankfurt in the year 1990 and became resident of the small local club called “Red Brick” a year later. At that time he was mainly playing Hip Hop, Pop and House. Buying his records at "Downtown Records" in Giessen, by 1993 he had already started discovering the more electronic side of music. Consequential to this growing passion for electronic music, and to be able to Dj on a regular basis, he opened the “Spinclub” in the beginning of 1994 in Giessen. And there were more changes. Together with his friend André Walter he started getting into music production, and later in the year they had their first release on “Global Ambition”. The label “Soap Records” was founded, alongside Tommy Bingel from "Downtown Records" and Toni Rios. Various records and remixes were released, like Traveller on "Harthouse", Noosa Heads and E.H.R. on "Soap Records". In early 1995 the “Spinclub” closed down. Chris started to work at “Eye Q Records” in Frankfurt, where he took care of the royalty accountings and the vinyl production. The useful experiences and contacts in the Techno scene he made in those days would help him later in his Dj career. When Pauli Steinbach, resident at the legendary “Omen” club in Frankfurt could not play one night in November 1995, Chris was called to fill in at short notice and took his chance. He received enthusiastic reactions from the crowd. From this impromptu booking on, until the club´s closing in fall 1998, Chris became a resident, playing alongside many international guests. In 1996 Chris left “Eye Q” and founded his first own label called “Audio” at the ”Under Cover Music Group”. Before the label´s closure in spring 1999, they released 17 tracks; amongst them, most notably, his own productions “Audio 07” and “Audio 11,” which received worldwide recognition. At the same time Chris developed a new passion by presenting his first radio show “Evosonic Update” which supplied the party crowd every friday afternoon with party tips and vinyl critics on the radio station “Evosonic”. 1999 the radio frequency of “Evosonic” was canceled, which also meant the end of the radio show. At the same time Chris separated from UCMG and had to leave his label “Audio” (later to be called "Fine Audio Recordings" after his departure) with them for legal reasons. Parallel he also changed his booking agency from UCMG to Cocoon booking in Frankfurt. To be able to go on releasing his own music, in the same year 1999 Chris founded the labels “CLR” and “CLAU” and together with André Walter “Stigmata”, which were distributed by “Prime Distribution” in England. The labels quickly established a worldwide standing and remix, as well as booking, requests started coming in from all over the planet. After the closure of the “Omen” and the consequential end of this residency, Chris played the “U60311” for the first time in spring 1999 and his new residency was born. From November 1999 on he started hosting his own night there, each first friday of the month. The party was called “Es Ist Freitagaaabend”, meaning “it´s friday niiight”, a popular phrase Chris used to shout on his radio show. In the much respected reader´s poll of “Groove Magazine”, Chris won a third rank in the category “national Dj”, right behind Sven Väth and Dj Hell. In the following reader´s poll of 2000 you could find Chris on rank 2 in the categories “national Dj” and “producer”. After the millenium Chris went “on air” again. On the 03rd of August 2000, Pauli Steinbach and Chris Liebing started the radio show “Pitch Control” which has been broadcasted from then on every thursday night between 10 pm and 12 pm on “HR XXL”. In the beginning of 2001 he founded “CLRetry”, a pure remix label. Gaetano Parisio, Adam Beyer, Steve Rachmad and Speedy J. released their versions of Chris´s “CLR 07” on three publications in a row. Release number 04 followed in the beginning of 2002 with remixes of CLR 08 and CLAU 06 by Chris Mc Cormack and Dj Rush. CLRetry 05 came by the end of summer 2002 with remixes of Ian J. Richardson and Ben Sims. In the reader´s polls 2001 of “Groove Magazine” and “Raveline”, Chris was still on rank 2 in the category “national Dj”, but acquired position 1 as “best producer” in both magazines. In the end of 2001, Chris got nominated in four categories at the “German Dance Awards” and won the award for “best producer” and “best Dj mix compilation”. Since middle of 2002 the CLR office is taking care of all of the labels, the promotion and the exclusive booking of Chris Liebing. Since then CLR is also available online under www.cl-rec.com. In 2002 Chris worked on his first artist album “Evolution” which was released on the 10th of June 2003. The dark but concise debut continued with Chris´s typical production style and created massive media attention with the enthusiastic critics. Again, in the important magazines you could find Chris on the first ranks in several categories of this year´s reader´s polls (best Dj, best producer, best label). In June 2003 he got nominated for the German Dance Award alongside with Paul van Dyk, Sven Väth and Westbam, and one month later surprisingly won in the category “best national Dj”. In the reader´s poll of “Raveline”, Chris got elected as “best remixer”, in the categories “best Dj” and “best producer” he achieved rank 2. In May 2004, Chris´s second double mix CD for U60311 named “Techno Division Vol.4” was released. It was his first mix CD after adding “Final Scratch”, “Air FX” and the “Fader Fox” to his Dj sets. This was already indicated on the CD cover which shows his laptop with the “Final Scratch 1” software on the screen. After playing in the first four seasons of the Cocoon residency on Ibiza, Chris played on Carl Cox´s night on Ibiza in 2003. The next season in March 2004 Chris received the request to host a night at Privilege, together with Mauro Picotto. Chris agreed and from July until September, each Wednesday night the “Meganite” was on. In the same year a productive and still persisting friendship between him and Speedy J. began. Together they produced a 12” which was released on the renowned UK label “Novamute” in the Collabs series as “Collabs 300”. The teamwork proved to be fruitful, and both producers decided to go on with the series by releasing two new tracks under the name “Collabs 301” in January 2005. In November 2004 the internationally renowned reader´s poll of “Dj Magazine” took place. 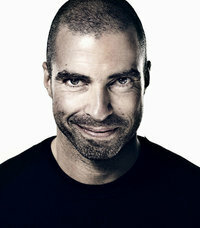 Chris Liebing climbed 65 ranks, up to rank 23 and became the “highest climber” in the magazine´s history of top 100 votings. Since 08.01.2005 Chris also hosts a 2 times a month residency at “Avalon” in New York. In November 2005 his live mix CD “Live In Beograd” and the studio album “Metalism” which he produced with Speedy J. were released. After two successful seasons with “Meganite”, Chris started his first own night on Ibiza called “Spinclub” (named after his club in Giessen), in summer 2006 at “Privilege”. Together with the residents Nick AC, Angel Costa, Benny Rodrigues and special guest and friends, the first season became unforgettable. In summer 2007 “Spinclub” continued on the terrace of “Space” (the legendary Ibiza club which had just won “Best Global Club” at the WMC / Miami). In November 2006, after seven successful years, Chris ended his party series “Es ist Freitagaaabend” at the U60311 in Frankfurt to be able to completely focus on the “Spinclub” events, his productions and the labels. In the same month he also released his second live mix CD “Live@Womb”, recorded in Tokyo. After one and a half years of planning and constructing his new studio, it was finally finished in the beginning of 2007. Chris started off producing the EP “CLR 16: A, B, C, D, Part One“, his first proper production in four years, which is available since March 2007. Only shortly after, CLR 17: A, B, C, D Part Two” was released. Later on in 2007, his third live mix CD “Live In Zürich” was released, and CLR celebrated a little anniversary with the round release number “CLR 20”. In the beginning of 2008, inspired by the successful 1997 season at "Space," the new label “Spinclub Recordings” was founded. The first release was the 2CD/DVD package “Chris Liebing presents Spinclub at Space, Season 2 – the complete collection“, a lively sonic and visual impression of what Spinclub at Space 2007 was all about. Apart from that, CLR released a double CD compilation called “Chris Liebing presents Selected Remixes” in April. With this release, Chris Liebing and CLR were drawing the balance of 10 years of remixing and being remixed. In summer 2008, Chris played on big festivals like “Nature One” again, where he also recorded his latest live mix CD. On Ibiza he played for Carl Cox in July and hosted an exclusive "Spinclub" party in September at “Space”. Parallel to the incessant touring, Chris also started to release EPs and singles on his new label “Spinclub Recordings”. In the studio he worked on remixes as well as own productions and released two proper tracks on the CLR 23 in November 2008. The album debut of Spinclub resident Brian Sanhaji called “Stereotype” was released by the end of November 2008 on CLR as well. The first residency of the Spinclub radio show started in summer 2008, every Thursday night on “Ibiza Sonica”. Due to the big success, Global Radio / Ibiza also asked for a weekly slot and started broadcasting the Spinclub show every Saturday night from December on. In the meantime Chris keeps working on the improvement of his DJ setup and sets, to squeeze out the very best of the new technical possibilities. 2009 was a year of many changes for CLR. Chris Liebing and his team celebrated the 10th anniversary of CLR, restructured the label, opened an office in Berlin and celebrated many great parties on Chris´ club and festival gigs. The residency at the BE nights at Space / Ibiza became a big success. As a bonus, he gives away the digital versions of his labels´ tracks for free to everybody who currently owns previous vinyls on CLR, CLRetry, CLAU and Spinclub Recordings along with for future vinyl purchases. And if his schedule wasn't busy enough, in the beginning of the year, Chris had begun with the production of the weekly CLR podcast, which by now counts more than 200.000 monthly listeners. He officially renamed CLR into CREATE LEARN REALIZE (as this is what he did most of his life) and by doing so he reinvented his own initials behind the label's name. 2010 CLR starts off with a new distribution by Word And Sound. The first common project is the 10 Years CLR Compilation with 10 exclusive tracks by many of Liebing's closest contemporaries, such as Speedy J, Alex Bau, Pfirter and Adam Beyer. All times are GMT -4. The time now is 03:55:19 PM.